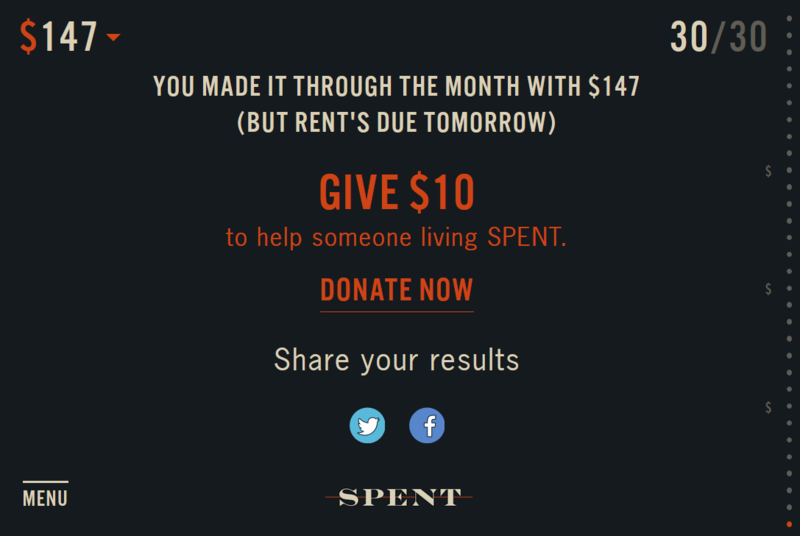 SPENT is an online game about poverty and the challenges it brings forth for each and every person. Throughout the game, players make series of decision which impacts their income. Each decision is connected to different dilemma and problem tied to the health, the level of education and providing the basic needs for your family members. Often there is no “good” solution to issue at hand, which for some, might raise the level of frustration. At the same time, thanks to such model of the game, everyone can gain the better understanding of the everyday struggles of people struck with poverty and homelessness. The game ends when players either run out of money before the end of the month or make it through with money left over. The player is given $1,000 to survive for one month. 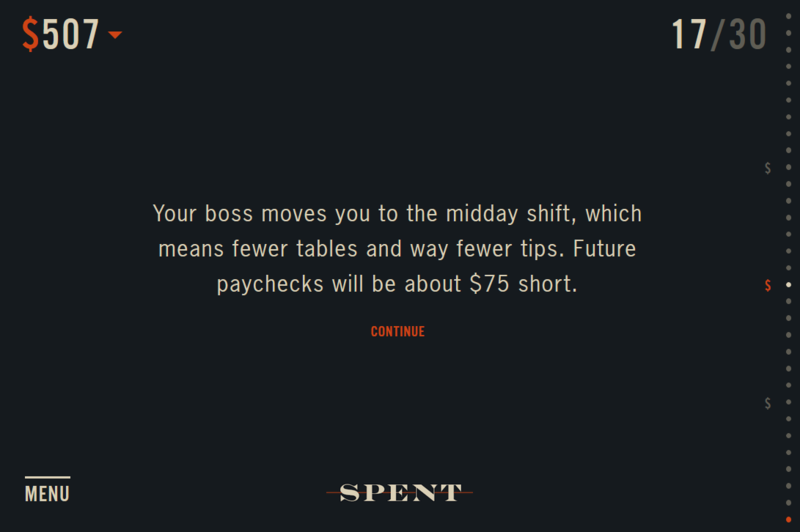 Throughout the game’s one-month period, the player faces dilemmas which reveal how quickly changes in employment, housing, medical costs and other expenses can have disastrous consequences for normal people. The player can ask the Facebook friend for help by connecting the game to the social media. At the end of the game, regardless of the results, the player is invited to join the cause of helping those struck by poverty by donating money to a non-profit organization. Players understand problems with managing a home budget in the world where even the most basic medical help costs money. Players learn that the changes in employment, housing, medical costs and other expenses can have disastrous consequences.